I've decided that 'moderation' is just not working... Not for weight loss. So it's back to strict eating. 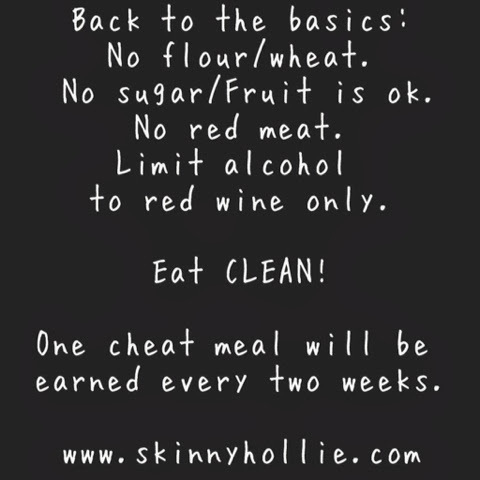 Same as December - February, only I will earn a cheat meal every two weeks as long as I have no cheats in between times. That will give me something to look forward to. My workouts will be the same... Different types of cardio plus continuing with the weights (which I'm finally getting used to). I'm pretty certain that this plateau is all about food, and if I'm rigid with my meals and leave absolutely no room for error I'll know for sure. I'm ready to finish September and the rest of the year strong. No excuses. I hear you and agree 100% I am eating to much crap lately and I need to back off of it. Going back to basics is always a good thing, that way we can track how to improve ourselves. Keep an eye the on amount of fruit you eat each day. There is growing evidence that excess fructose consumption may facilitate insulin resistance. And insulin resistance can produce more cravings, something unwanted if we are trying to lose weight. It's all about finding what works for you! Good luck!